The Logo above is the official logo of the Schipperke Club of Canada and was provided to members to recognize the club. The logo was provided to me by Fran Hoye, and the colour rendition was done by Steve Kress. 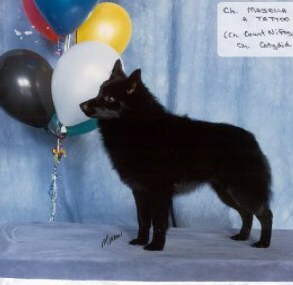 This is the first, most complete website on the Schipperke in Canada with history of the breed, hundreds of photos of breed winners as well as Specialty winners. What is a Schipperke? A small, black, tailless dog originating in Belgium. The history of the Schipperke is unclear, however one thing fanciers know - once you have had a Schip you will never be without one again. Please take your time and explore our web page. We hope to introduce you to this wonderful breed and provide you with contacts if you are looking to add one to your home. 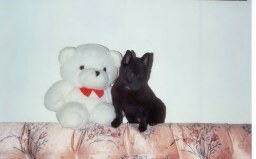 Come back often as we update our website with shows, schipnics and news in the Schipperke World!